Why the thermal imaging of Mercury's surface requires a telescope on a jet flying through an eclipse? 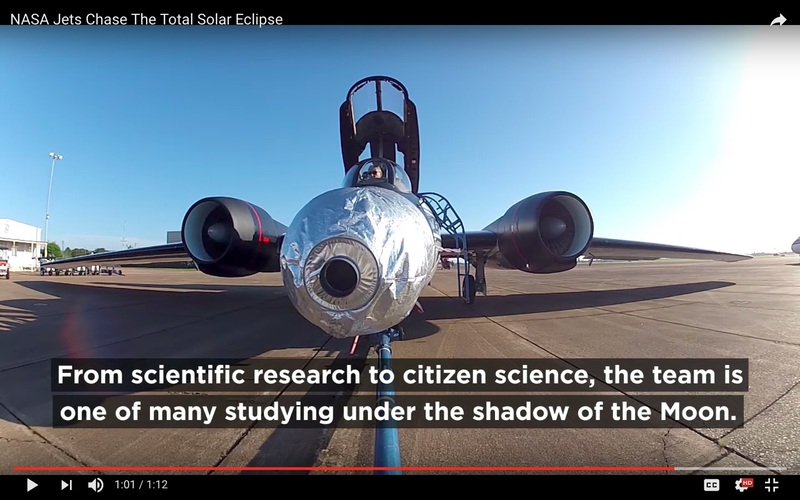 The NASA News Feature Chasing the Total Solar Eclipse from NASA’s WB-57F Jets describes two telescope-equipped NASA jets that will fly fast enough to spend about 7 minutes in the Umbra (totality) of the upcoming August 21, 2017 solar eclipse. In addition to using the moon as a sort-of natural coronagraph to look for never-directly-observed-previously nanoflares in the Solar corona, they will try to image the surface of the planet Mercury in the infrared in order to generate surface temperature maps. These images, taken in the infrared, will be the first attempt to map the variation of temperature across the surface of the planet. Why is this a type of observation that requires such an heroic effort - flying a telescope through a total solar eclipse, using the Moon as a coronagraph? There is no way to do this with NASA's airborne infrared telescope, the Stratospheric Observatory for Infrared Astronomy (SOFIA)? Nothing (civilian at least) in space has ever had this capability? I'm looking for a fairly technical answer. If this were possible with SOFIA it seems it would have been addressed long ago. So there must be something specific to the eclipse. Why not a satellite-based telescope to observe Mercury in the thermal infrared? Space-borne satellites that are designed to look at the Sun (e.g., SOHO) aren't instrumented to look in the thermal infrared, while satellite-based telescopes that are instrumented to look in the thermal infrared in general don't point anywhere close to the Sun. One issue with imaging Mercury from roughly one AU is accidentally imaging the Sun. Hubble was never allowed to point to Venus, let alone Mercury. Another issue is cooling. Even if the telescope isn't directly imaging the Sun, key unshielded portions of the satellite will inevitably be facing the Sun while imaging Mercury. Thermal imaging satellites need to be cryogenically cooled. Pointing a space-based thermal imager at Mercury would reduce the vehicle's usable lifespan. Neither of those issues (accidentally imaging the Sun and heating problems) is an issue in the case of satellites sent to Mercury. To date, only two satellites have been sent to Mercury (Mariner 10 and MESSENGER) and one is on the way (BepiColombo). MESSENGER was not instrumented to see in the thermal infrared. Mariner 10 was and BepiColombo is. Mariner 10 made three flybys of Mercury in 1974 and 1975. These included observations in the thermal infrared, but the received data were limited. Why not a ground-based telescope to observe Mercury in the thermal infrared? There would be so much thermal infrared airglow when the Sun is below the horizon so as to make observations of Mercury worthless. There would be too much of a chance of accidentally imaging the Sun when the Sun is high in the sky. Cooling is of course an issue as well. The above do not apply if path of a solar eclipse happens to pass over a thermal infrared telescope. Exactly that happened in July 1991, when Mauna Kea observatory was almost exactly in the center of the path of totality. The infrared telescope at Mauna Kea was most definitely put to use during this eclipse, but not to look at Mercury. Apparently observing Mercury wasn't given a high enough priority. For one thing, it's construction is suboptimal for this usage; see the other answer. For another, it's too valuable. SOFIA's predecessor, the Kuiper Airborne Observatory (KAO), was used twice to observe Mercury in the infrared. 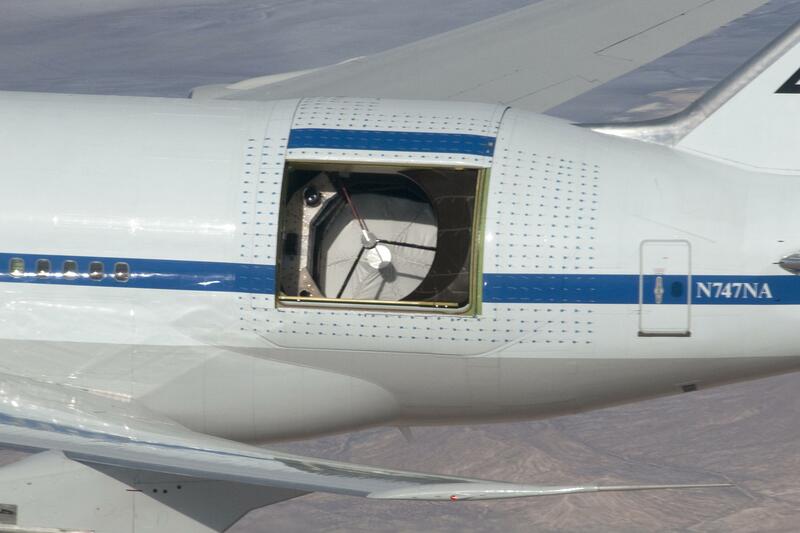 The aircraft's fuselage protected the telescope against seeing the Sun. However, because of the possibility of pointing errors that might result in imaging the Sun, these observations were made at the end of the KAO's life. (SOFIA was about to replace the KAO.) SOFIA isn't yet at the end of it's life. Solar eclipses provide unique opportunities for observing the Sun, and also apparently for observing Mercury. Solar eclipses have long been accompanied by numerous scientific observations specialized to take advantage of the eclipse. It doesn't have to be done during an eclipse. Mercury does need to be fairly high in the sky to be able to see it in thermal infrared, even at the high altitude at which NASA's WB-57s fly. A total eclipse is not essential for this experiment. The personnel and aircraft are being used to observe the Sun during totality, and this apparently conflicts with the Mercury observation experiment. The Mercury observations instead are being performed 30 minutes prior to and after the total eclipse. Being a one-off experiment, and being a secondary experiment, (the primary experiment is observing the Sun), the possibility of accidentally imaging the Sun is not a complete disaster. The Sun will still be partially eclipsed by the Moon during that period. This will reduce the amount of secondary light (solar thermal infrared absorbed and reemitted by the atmosphere, eventually reaching the instrument) compared to that which results from an uneclipsed Sun. It could be done by SOFIA, but it would be rather limited. There's actually a really great explanation of why SOFIA isn't the best choice. Basically, it comes down to the location of SOFIA's telescope. It points out to the left. If the observatory were to make an eclipse observation, it would have to fly perpendicular to the Sun, which would shorten the observation period to under 2 minutes. Also, this would be a very high risk activity, if the timing was even slightly off the telescope could be damaged. This applies to any telescope making such observations, but Sofia, being a full sized jet, lacks the maneuverability that other telescopes might have. Any satellite making such an observation would have the same risk as Sofia, and even less time to take advantage of it, thus limiting any satellite capability. There are other options. HIAPER would be one such plane, for instance. 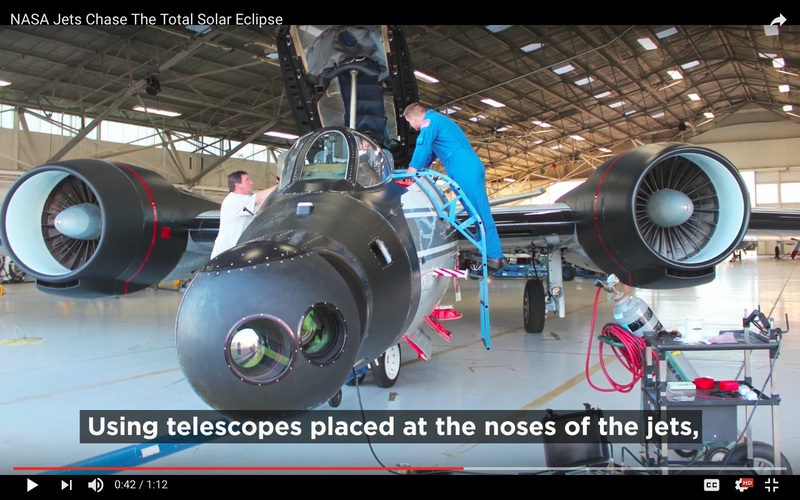 But these types of aircraft are in high demand, mostly to study the sun itself, my guess is they found a way to make a jet work for them for this particular solar eclipse to do the Mercury research they desire. This is primarily a radar plane, but can be configured for other instruments if required. As for why during an eclipse, there's a few reasons. The main is that Mercury, at is maximum elevation, is only 28 degrees from the Sun! But that applies to one on Earth's surface, it is somewhat distorted if you are higher up. And that is required to do any such observations. Basically, the Sun has to be low enough that there isn't any stray light coming from it at all, which due to atmospheric effects could happen for some time. I'm not sure about the refraction piece, but the horizon angle at 13 km is about 15 degrees. Given that the Sun would have to be below 15 degrees, and the SOFIA points slightly up, it seems that if it could do it, it would require the perfect alignment, and even then only barely. Not the answer you're looking for? Browse other questions tagged imaging space-telescope thermal mercury or ask your own question. Friendly temperatures at day/night junction in Mercury? Through what process does MESSENGER undergo orbital decay? Why would the James Webb Space Telescope need adaptive optics outside the atmosphere? Infrared space interferometry - Why isn't it being done? Why are deeper folds better for absorption? How to use this Google Mars viewer to find this Martian landslide event? RIP Kepler, how shall we call your orbit? Does this cyclic flip-flop process have a name?